Lifetime 6415 sheds provide you an excellent yard storage solution that will last for years to come. This shed uses a paneling design to assemble the shed; adjacent panels interlock and fasten together. The shed is then reinforced on the inside of the shed with powder-coated steel. 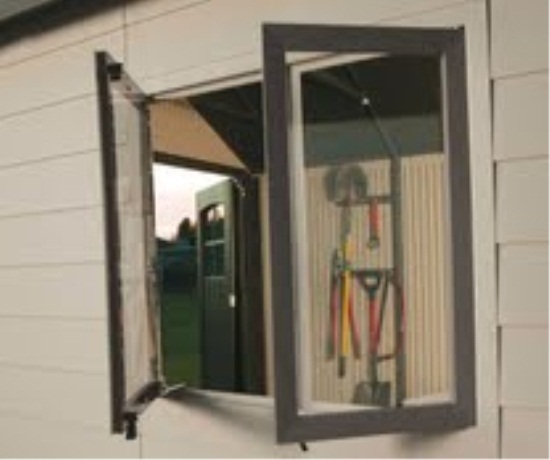 The shed doors have a built-in padlock (actual lock not included). 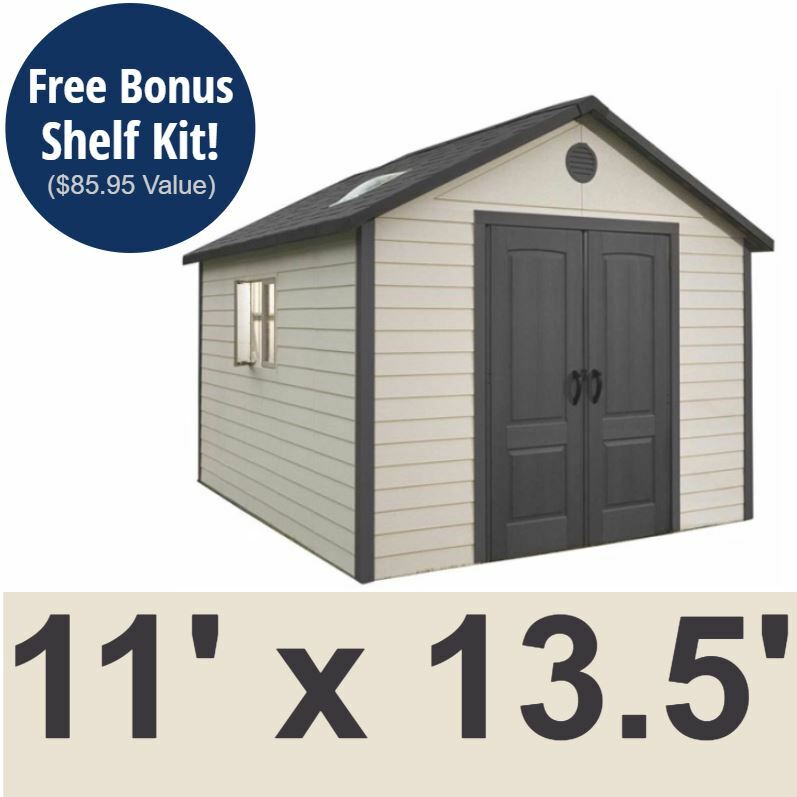 The Lifetime 6415 sheds come with a 10-year factory warranty from Lifetime Products. Lifetime Outdoor Storage Sheds are made with high impact polyethylene plastics that do not degrade while outdoors like vinyl does, and are steel reinforced in the walls and roof providing sturdy support for storing whatever you need. This Lifetime Storage shed has a large interior designed to meet a broad range of storage needs! Great for use as a Garden Shed. Includes a 30-day (from the day you receive the product) money back guarantee if you are not completely satisfied simply keep the original packaging and contact us for a pickup. View 6415 brochure for Lifetime Hillcrest shed. 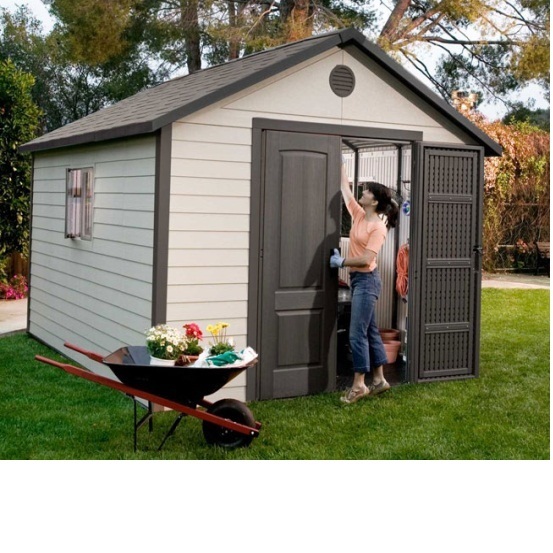 This lifetime outdoor storage shed is durable, sturdy and is designed to meet a broad range of storage needs. 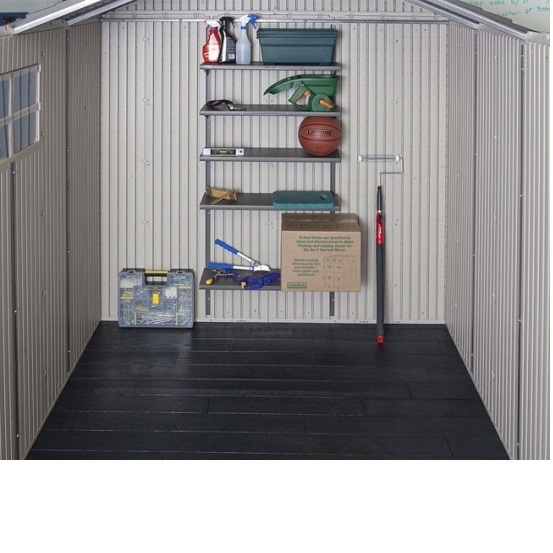 Great shed for Lawn and Garden Organization and Storage! 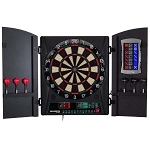 Features - It has Vents, Windows, Lights, True Door Handle, Steel Support Shelving, etc. Due to the excellent, spacious interior, the Lifetime Storage building provides plenty of space to store riding lawn mowers and ATV's. 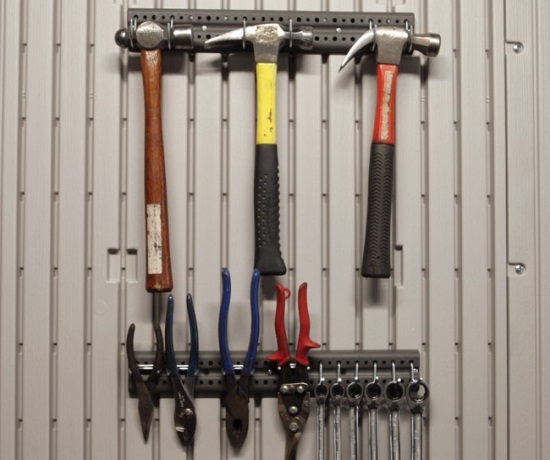 The Lifetime shed has shelves and areas to store your tools and other products. This storage building is also used for an art area to store pieces of art. The storage buildings are putty colored with darker brown trims. *Assembly Required on Lifetime Outdoor Storage Products. A wooden framework or cement slab is recommended for support under the shed. 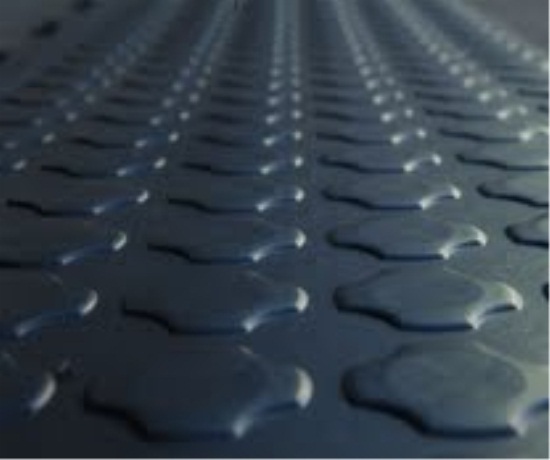 The shed floor is not a weight-bearing floor and will need some sort of solid support to keep from breaking or damaging the floor. *Lifetime Plastic Shed extensions sold separately. A wooden framework or cement slab is recommended for support under the shed. The shed floor is not a weight-bearing floor and will need some sort of solid support to keep from breaking or damaging the floor. 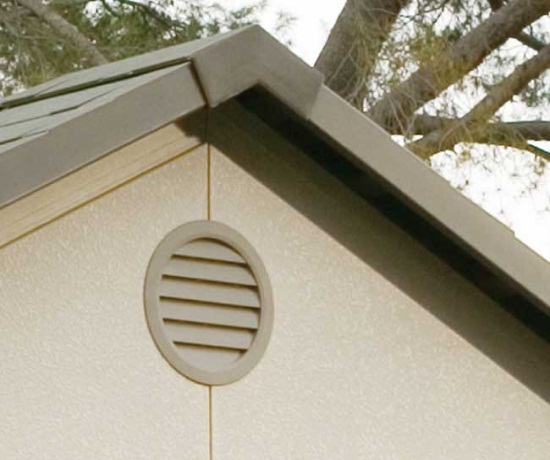 Competitive Edge Storage Sheds are manufactured by Lifetime Products. Competitive Edge Products is an authorized reseller of Lifetime Products Outdoor Storage Sheds and Accessories and is a trusted eBay seller. Nominal Dimensions - 11 x 13.5. Footprint - 124.25 inches w x 154.5 inches d.
Exterior Width - 123.75 inches. Exterior Roof Width of 132.75". Exterior Depth - 153.5 inches . Interior Width - 120.5 inches. Interior Depth - 150.5 inches. Square Feet - 125.5 square feet. 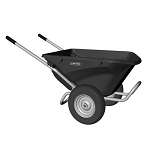 Cubic Feet - 983.2 cubic feet. Shed shipped promptly. Provided additional requested info on shed. Perfect item! Easy to assemble! Better than described! Thank you! This shed was easy to put together and the size is perfect! My husband was very hesitant to choose a larger size but now he is so pleased we chose the larger size. I did a lot of price comparison before finding the CE company. The size for the price and quality is awesome. I believe in truthful advertising and the Lifetime shed I got is as advertised. I simply followed the assembly instructions and in a couple of days I had a shed. I am very happy with my purchase so far and would recommend it to anyone needing some additional storage space. Best web site I have ever ordered from. Even calling in the people were very helpful. Q: Can you vet this size with 2 windows that open what is the cost and what size windows? Q: On the 11 x 13 1/2 shed can I purchase a 3 foot extension to make it 11 x 16 1/2 or do you sell something close to 12 x 16? A: The extensions are 2.5' only I'm sorry to say. Feel free to contact us with any other questions. Q: What color are walls & roof? 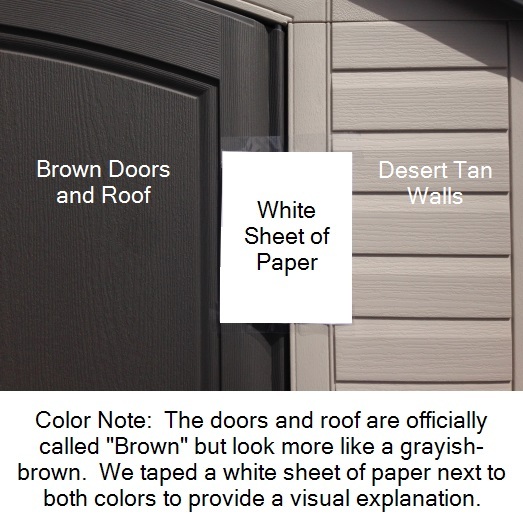 A: The walls and roof are brown although they look like they have a hint of gray in them and the walls are tan. The official color is desert tan. 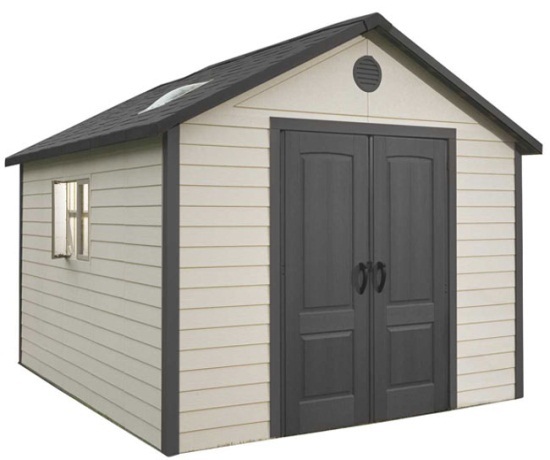 Q: Is it possible to get this shed with additional doors located on the side wall? A: Unfortunately, it is not possible. The doors are not sold separately. Q: Do I need to build a wooden base or concrete pad? The manufacturer recommends placing the shed on a flat structure such as a wooden foundation made of treated 2 x 4's and OSB board that you can pick up from your local home improvement store. 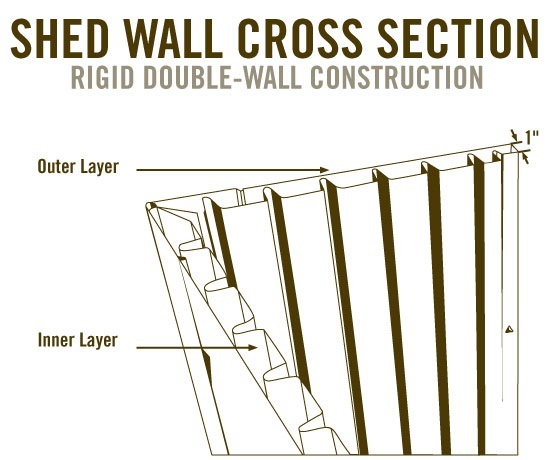 The instructions show just how to build it and what materials are needed. The other recommendation is a concrete slab. The concrete slab is more pricey to erect. Some customers put it on cinder blocks, pea gravel, or other flat structures. The important thing is to make sure it is flat and drains well. If it isn't flat you may run into issues with your doors closing properly. Feel free to contact us with any other questions. Do I need to be present at the time of delivery? Q: How long does it take to assemble this storage building? 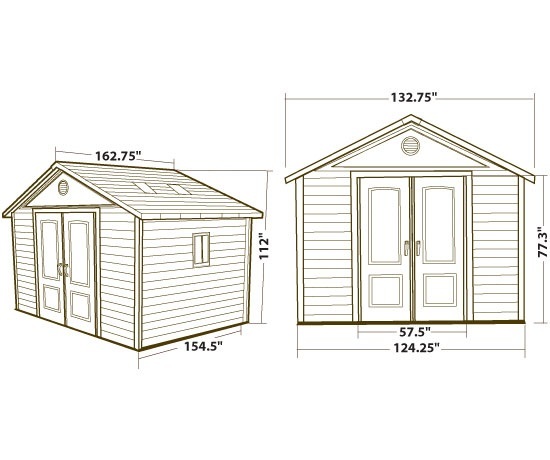 A: With the help of at least 2 other people, this shed will typically take around 10 hours to build. Familiarity with tools, instruction manuals, and basic assembly skills can make that time shorter or longer accordingly. Regarding Shipping. Orders for the 6415 Lifetime Shed generally leave the warehouse within 3 business days. 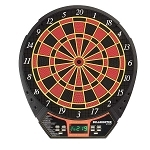 This product ships directly from Lifetime Products in Clearfield, UT. 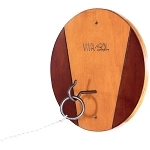 Delivery of this product is via a curbside delivery through an ltl carrier. The customer must be present to sign for the package and move the boxes where they need on the delivery property. Delivery appointments are scheduled through the delivery company before delivery is attempted. The customer can either contact the freight company themselves once they have the tracking number, or they can wait for the freight company to contact them to schedule the appointment. Call or email us with any questions.